The Dallas Cowboys lost five games by a total of eight points this season. 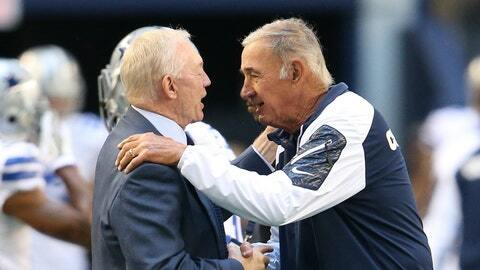 To Jerry Jones, that means the team is close to being a Super Bowl contender. Part of what Jones does after a disappointing year is find ways to spread hope to the team’s fan base. He did that Tuesday morning on a few occasions. The Cowboys suffered one-point losses to Kansas City, Detroit and Green Bay, a two-point loss to Philadelphia and a three-point loss to Denver. With some improvement, Jones sees those as games Dallas can win in the future. "I’d like to see how many games we could win if we can compete the way we competed the other night against Philadelphia," Jones said on 105.3 The Fan [KRLD-FM]. "I think we can have better players on the field than we had against Philadelphia. I think if we can compete with the kind of effort that we made then we’ll have a chance to win a lot of ballgames next year. "Now, we didn’t win that ballgame and I’m not as disappointed in the game and that specific outcome as I am what happened because of the outcome, which means that we had to go home and we couldn’t play in the playoffs. But if we can compete at the level that we competed this year against teams like Denver â I think we lost five games by eight or nine points â if we can compete at that level, then we’ll have a chance to win more games than we won this year." So how does Jones plan on getting the Cowboys over the hump? Well, by building off the changes that were made entering this season. That means, adding players that fit the 4-3 defensive scheme and possibly upgrading the protection in front of Tony Romo. "We won’t have the changes that we had last year in the coaching staff area," Jones said. "We made some philosophical changes this year with Romo and his influence that he has in the offense. We made some changes regarding the philosophy of the defense. We need to practice that. We need to improve that to the extent that we can add personnel, which we certainly can through the draft, and possibly we’ll have a chance to do something in the free agency effort to the extent we can add to what our players have already learned in the system of Monte Kiffin, which is the 4-3, simplistically put, to the extent that we can continue to develop this offensive line, maybe add to it. "We just got to see where the draft comes and just see what the situation is in free agency. We got a chance to be better. That’s the plan. By the way, we were working on this plan before we played the other night. This is a thought process we’ve been going through for several weeks." Jones reiterated that he’s "big time committed" to Romo and says he thinks the Cowboys are going to benefit from what Jason Garrett has learned since becoming head coach in 2010. "He’s got some fundamental things that are outstanding," Jones said of Garrett. "He’s the kind of coach that really gets a lot of respect from his players and he has them competing. We just need to compete at a better level so that we can have more success than we have right now. "I’m not at all satisfied. But the bottom line is, in my judgments, the better way for us to get to where we’re trying to go, which is more wins, playoffs and beyond, is to do the things you’re going to see me do and us do over the next weeks ahead." Jones never elaborated on what those "things" will be.